2 On your diamond wedding anniversary I wish you all the best. May all your dreams come true. Or have you fulfilled all your dreams already? 3 He is the boss and she lets him believe it � thats the real secret behind a successful marriage which lasts 60 years already. 4 You got married 60 years ago and the party is still going on. 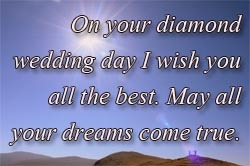 All the best for your diamond wedding. 5 I am sending you 60 hugs for your diamond wedding. May lots of years full of luck, healthiness and happiness will follow. 7 The secret for a long and happy marriage seems to be lifted because you two have been married for 60 years now. All the best for your diamond wedding. 8 We wish this lucky couple lots of health, luck and success on your 60. Wedding Anniversary. 9 I wish you all the best on your 60. Wedding anniversary. If I get married I hope for such a successful marriage as you have had it for the past 60 years. Please vote for your favourite diamond wedding anniversary wishes to support our toplist of best greetings and messages.